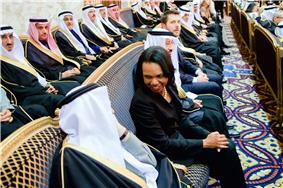 Condoleezza "Condi" Rice (; born November 14, 1954) is an American political scientist and diplomat. She served as the dissolution of the Soviet Union and German reunification. From 1980–1981, she was a fellow at Stanford University's Arms Control and Disarmament Program, having won a Ford Foundation Duel Expertise Fellowship in Soviet Studies and International Security. The award granted a year-long fellowship at Harvard University, Stanford University, Columbia University, Massachusetts Institute of Technology or University of California, Los Angeles – Rice contacted both Harvard and Stanford but claims Harvard ignored her. Her fellowship at Stanford began her academic affiliation with the University and time in Northern California. At a 1985 meeting of arms control experts at Stanford, Rice's performance drew the attention of United States National Security Council. 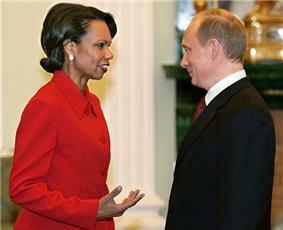 According to R. Nicholas Burns, President Bush was "captivated" by Rice, and relied heavily on her advice in his dealings with Mikhail Gorbachev and Boris Yeltsin. Because she would have been ineligible for tenure at Stanford if she had been absent for more than two years, she returned there in 1991. She was taken under the wing of Ronald Reagan's Secretary of State from 1982–1989), who was a fellow at the Hoover Institution. Shultz included Rice in a "luncheon club" of intellectuals who met every few weeks to discuss foreign affairs. 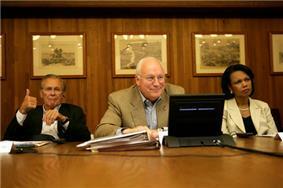 In 1992, Shultz, who was a board member of Chevron Corporation, recommended Rice for a spot on the Chevron board. Chevron was pursuing a $10 billion development project in Kazakhstan and, as a Soviet specialist, Rice knew the President of Kazakhstan, Nursultan Nazarbayev. She traveled to Kazakhstan on Chevron's behalf and, in honor of her work, in 1993, Chevron named a 129,000-ton supertanker SS Condoleezza Rice. 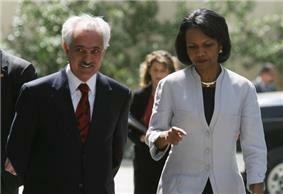 During this period, Rice was also appointed to the boards of Transamerica Corporation (1991) and Hewlett-Packard (1992). 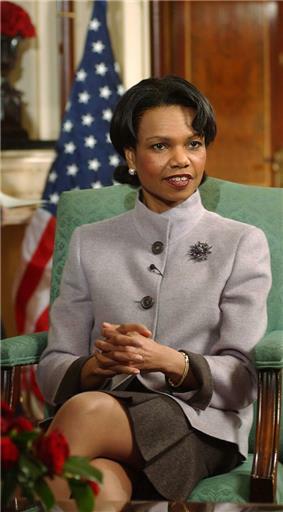 Rice headed Chevron's committee on public policy until she resigned on January 15, 2001, to become oil tanker Condoleezza Rice after her, but controversy led to its being renamed Altair Voyager. From 1989 through March 1991 (the period of the fall of National Security Council, and a Special Assistant to the President for National Security Affairs. 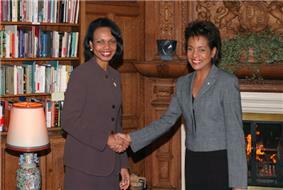 In this position, Rice helped develop Bush's and Secretary of State James Baker's policies in favor of German reunification. She impressed Bush, who later introduced her to Soviet leader Mikhail Gorbachev, as the one who "tells me everything I know about the Soviet Union." 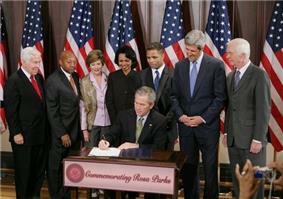 During the summer of 2001, Rice met with  held at the White House at Tenet's request to brief Rice and the NSC staff about the potential threat of an impending al Qaeda attack. Rice responded by asking Tenet to give a presentation on the matter to Secretary Donald Rumsfeld and Attorney General John Ashcroft. Rice characterized the August 6, 2001, President's Daily Brief Bin Ladin Determined To Strike in US as historical information. 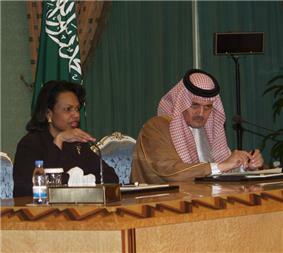 Rice indicated "It was information based on old reporting." Sean Wilentz of Salon magazine suggested that the PDB contained current information based on continuing investigations, including that Bin Laden wanted to "bring the fighting to America." 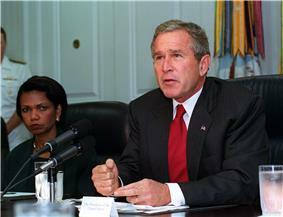 On September 11, 2001, Rice was scheduled to outline a new national security policy that included missile defense as a cornerstone and played down the threat of stateless terrorism. ^ "Dr. Gates' team also ordered an admixture test for Condoleeza. 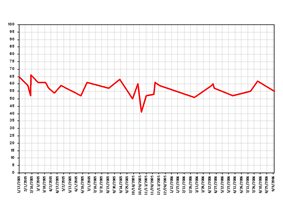 This DNA analysis revealed that her genetic makeup is 51% African, 40% European and 9% Native American or Asian", and "Condoleezza was surprised to learn that her mtDNA traced back to the Tikar people of Cameroon"
^ A rough draft is also available. ^ Question: "And would you consider vice president?" Rice: "Not interested." ^ U.S. State Department Remarks With Senator Richard Lugar on the U.S. Department of State and the Challenges of the 21st century July 29, 2005. Retrieved June 26, 2012. 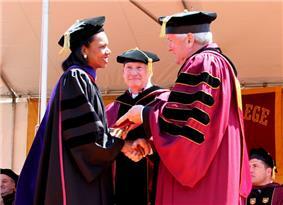 ^ Chestnut, J. L., Jr. Condi Rice's disdain for Civil Rights movement Catholic New Times, December 18, 2005. Retrieved April 12, 2007. ^ "Why the Crass Remarks About Rice?". 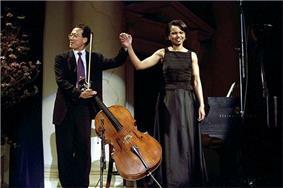 The Washington Post, January 22, 2005. ^ a b Jonathon Tilove. For Black America, The Thrill of Powell and Rice Is Gone. 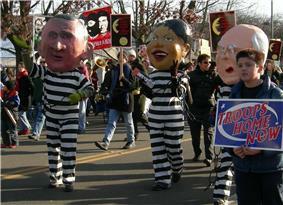 Newhouse News Service, March 11, 2004. Retrieved June 26, 2011. ^ Marc Merano. Harry Belafonte Calls Black Republicans 'Tyrants'. Cybercast News Service, August 8, 2005. ^ Interview with Bill O'Reilly of the O'Reilly Factor on Fox News September 14, 2005. Retrieved June 26, 2012. 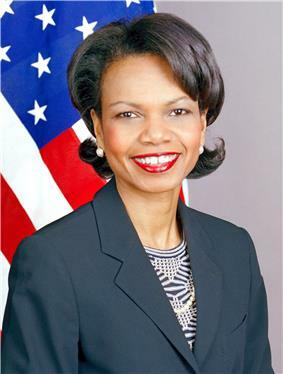 Rice has been criticized both in the U.S. and abroad for her involvement in the Princeton University and Boston College. 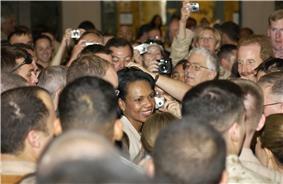 Her BC appearance also prompted the resignation of an adjunct professor Due to student and faculty outcry over her advocacy for the U.S.-led invasion of Iraq and her support for waterboarding by the U.S., Rice backed out of giving her scheduled 2014 commencement address at Rutgers University. There has also been an effort to protest her public speeches abroad. Rice has also been a frequent critic of the intelligence community's inability to cooperate and share information, which she believes is an integral part of preventing terrorism. In 2000, one year after Osama bin Laden told Time “[h]ostility toward America is a religious duty," and a year before the CIA and foreign intelligence and the FBI and domestic intelligence." She then added: "There needs to be better cooperation because we don't want to wake up one day and find out that Osama bin Laden has been successful on our own territory." 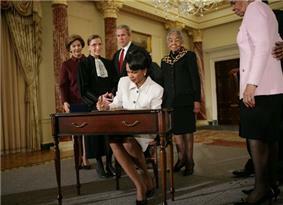 Rice signs official papers after receiving the oath of office during her ceremonial swearing in at the George W. Bush.